ET 302 on a regular flight to Nairobi, Kenya has crashed 6 minutes after take off. Plane had 148 passengers, 8 crew members on board. Four month old B737,Fine weather,if it looks like a duck, swims like a duck, and quacks like a duck,Sabotage. Maybe but it is the second B737 max in the same conditions within 6 months. "Only" the lonely I agree. We wait guys...I know that’s the hardest part in situations like this but we just have to. Knowing ET their rescue guys are out there and we should get some more information later this evening. flight and try not to speculate until the facts are out. This is is the most noble thing to do in our profession at times like this. Respect Always.Boeing has problems me thinks. 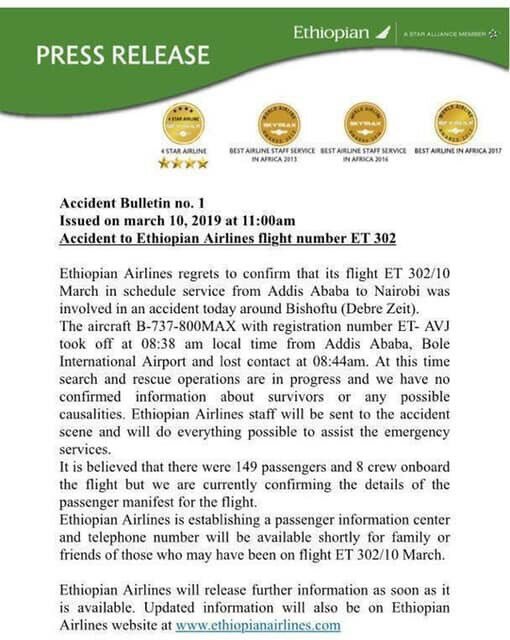 My sincere condolences to all the family,friends,colleagues but last and not the least Ethiopian Airlines of this terrible accident. RIP all onboard this flight. Last edited by bianchi; 10th Mar 2019 at 19:42. Sincere condolences to all families who lost someone on this flight. How can the FO possibly only have 200 hours!? Did they mean PICUS on type? I think some people reading this will find that quite unsettling at this critical time. Well I guess that is MPL program, the industry found a way to reduce the 250h minimum required we used to have few years back to about 175h including sim hours. Cost saving, short training period, it took me 3 and half years from zero to cpl ir more than 10 years ago and that was considered as fast. The difference is those kids can only fly multi crew a/c as FO in the company. Everyone is happy! Ah MPL, true, good point. Still I find that most alarming. Australia has joined the ban of the MAX from it's airspace. US senators Mitt Romney and Elizabeth Warren have called on the FAA to follow several other countries and temporarily ground Boeing Co's 737 MAX 8. Let's hope FAA will do something coz that will force Boeing hand to act! A very sad tragedy! Is there anything we Africans can do to counter the stream of sick videos circulating on social media and purporting to show this crash? After my team had an incredibly close brush with this event, I spoke to a colleague who was very distressed by a video which she truly believed showed the cabin immediately prior to the crash. It showed an ET aircraft undergoing a decompression event with everyone on oxygen, but of course absolutely not ET302. I assured her it was fake, she refused to listen. She insisted she knew the woman whose son sent it to her from onboard. Is there anything we Africans can do to counter the stream of sick videos circulating on social media. Both Cockpit Voice Recorder and Flight Data Recorder off to France for analysis. 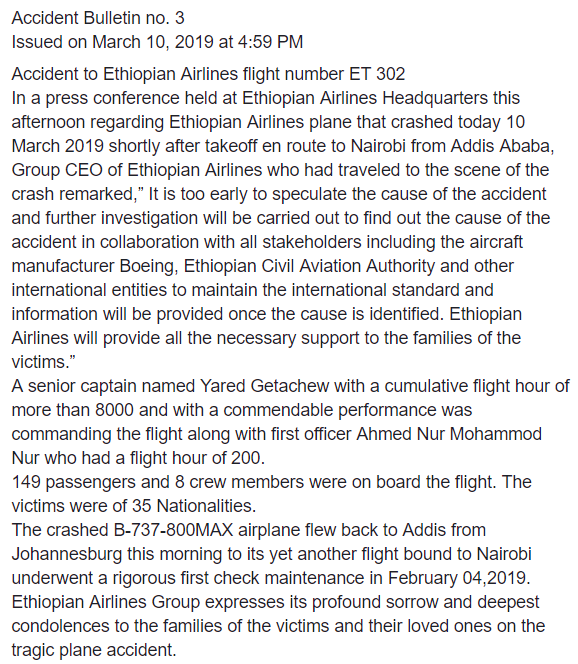 Good on Ethiopian for taking their time to seriously consider and decide where the black boxes should go.